“So whether you are managing a software company, a hospital, a bank or a Boy Scout organization, the differences apply to only about 10 per cent of your work. This 10 per cent is determined by the organization’s specific mission, its specific culture, its specific history and its specific vocabulary. The rest is pretty much interchangeable”, Peter Drucker. “Leadership and learning are indispensable to each other“, John F. Kennedy. “Corporations and managers suffer from a profound social ambivalence” (leading theorists) Sumantra Ghoshal, Christopher Bartlett and Peter Moran. “With the economy in disarray and so many financial firms in free fall, analysts, and even educators themselves, are wondering if the way business students are taught may have contributed to the most serious economic crisis in decades”, The New York Times. “It’s like trying to teach psychology to a person that has never known anybody”, Henry Mintzberg. “Today’s troubles have been driven not just by greed, but by a lack of confidence. I think the average employee, maybe a business school graduate, lacks the confidence to ask the tough questions”, Frank Brown (Dean Emeritus of INSEAD). “To give style to one’s character — a great and rare art! He practices it who surveys all that his nature presents in strength and weakness and then moulds it to an artistic plan until everything appears as art and reason, and even the weakness delights the eye”, Nietzsche. “In future those who stump up [for the cost of a business education] will do so because they want to learn the skills, not because they think they are buying entry into a cool end exclusive club”, Lucy Kellaway of the Financial Times. “A large number of employers use coaching to enhance the value of learning and this may be a growing field for executive education purchasers to maximize the value of individuals learning. Looking ahead, one of the main requirements of purchasers is a greater focus on personalized learning plans”, EFMD-Carrington Crisp. Flexible and tailored to student needs, with asynchronous sessions. Participation in “Learning Communities”, since technologies allow for a wide acces to social networks. Continuous feedback and personal assessment through sophisticated applications. Keeps the momentum of learning, as opposed to the static and transilient experience of the traditional classroom session. Creates new markets and clients, with the potential of reaching the entire world. Evidence of the “hubization” of management education is the fact that some analysts cite some particular cities as centers that host a critical number of leading business schools. The Financial Times, for example, listed New York, Chicago, London and Madrid as hubs of executive education institutions in an article some years ago, and The Wall Street Journal has pointed out how some cities in Europe –notably London, Madrid or Paris — host an important number of highly ranked business schools. 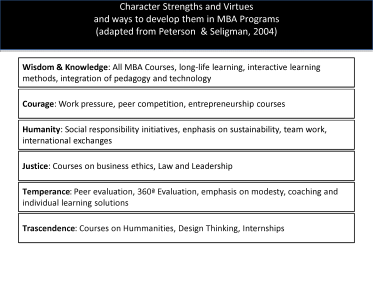 From Book: Figure 8.1 shows the most relevant stakeholders in business education. A. Sen, The Argumentative Indian. Writings on Indian History, Culture and Identity, (London: Penguin Books, 2005). “you know nothing”, Socrates to his new pupils. Quotes from Chapter 10 – Faculty and knowledge creation. How does it work? Text from book: Professor Costas “Markides’ (London Business School) proposals to encourage younger scholars to publish not just in academic journals, but also in professional publications, are the way forward. In this way we will see the transfer of research to teaching, as well as encouraging cooperation between businesses and consultancies to identify new ideas and models for research”.